Desh Bhagat Global School organised an Awareness Rally to draw the attention of the people and make them aware of Noise and Air Pollution which is causing many diseases, espacially in festive season. The rally was flagged off by University Pro Chancellor Ms. Tajinder Kaur . 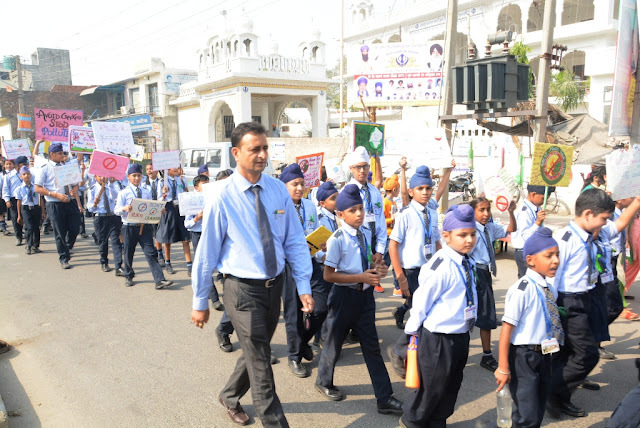 All the students along with their teachers were looking highly energetic and eager to spread their message to the people that they can save themselves from many other serious diseases with precaution, awreness and care only. 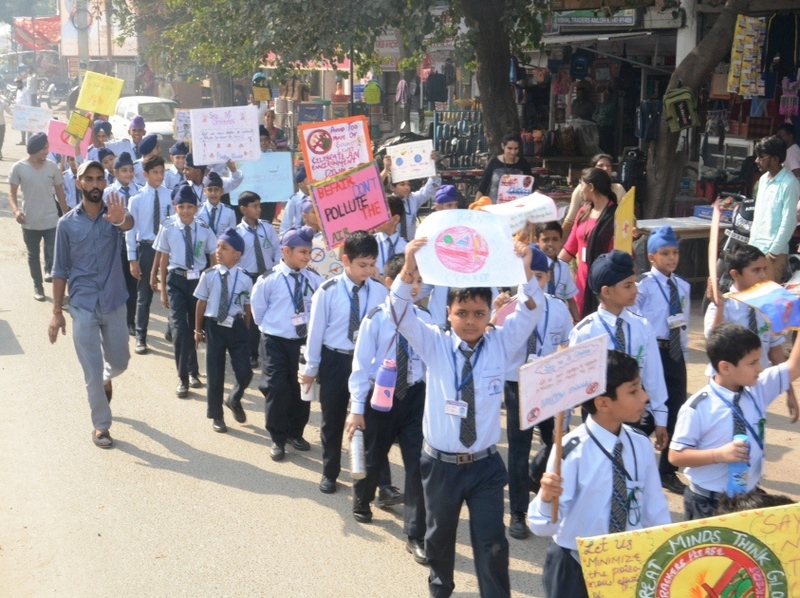 The Rally lead by Band team of students accompanied by teachers went to Amloh city and surrounding areas, raising slogans and hoisting banners to save people from all types of Pollution. 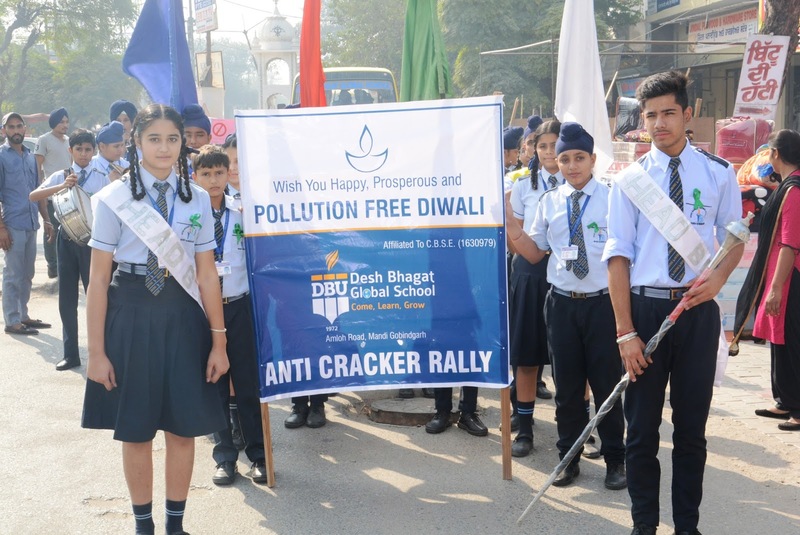 Slogans like – ‘Green Diwali Eco Friendly Diwali' , 'Say Not to Big Crackers', ‘Keep Clean Save Life’, ‘Don’t Pollute Natural Resources’, ‘Precaution is Better Than Cure' were carried by students. Desh Bhagat University Chancellor Dr. Zora Singh while blessing the students and the school team lauded the initiative taken by them. School Principal Vinod Kumar Sharma said that the aim of the rally was to create awareness among the people and people were so happy with the wonderful efforts of small children that they also joined the rally. Different socities and social welfare clubs of Amloh welcomed and appreciated the step taken by the school and the children.